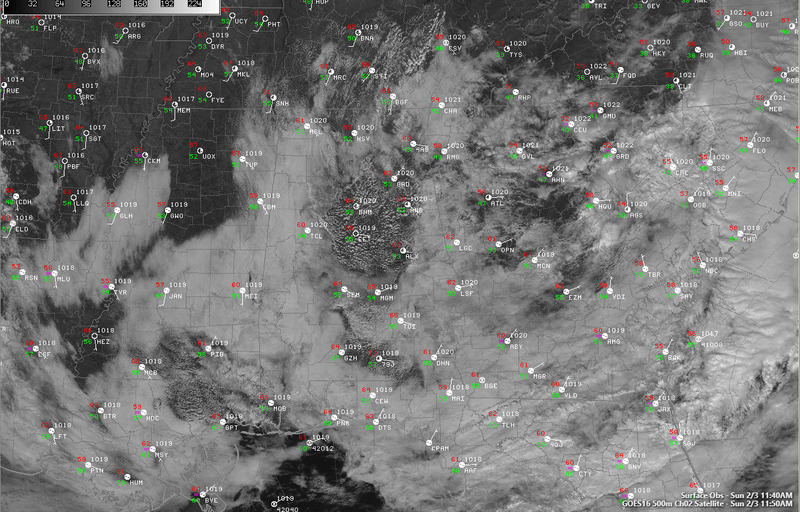 A thick layer of stratus across Alabama from this morning is rapidly eroding as sinking air behind a departing upper-level disturbance works with an increasingly stronger winter sun to evaporate them. Stratocumulus clouds are filling back in in the sunny areas thanks to the colder temperatures aloft behind the disturbance axis. Temperatures are climbing through the upper and 50s and 60s now across the northern half of Alabama. The nearest rain is exiting Georgia right now and the rest of our day should be dry. The next rain will come Monday morning though, as a wave of moisture spreads into the state from Mississippi. It will be followed by an afternoon and early evening of splash and dash showers. Highs will be in the middle 60s. Expect another round of rain Tuesday morning but increasing sunshine will push highs into the 70s Tuesday, Wednesday, and Thursday. Cooler Friday after a round of showers and storms Thursday night and Friday morning, followed by cooler conditions for Saturday.